Above: Jon Pertwee and a Yeti...on a loo, yesterday. 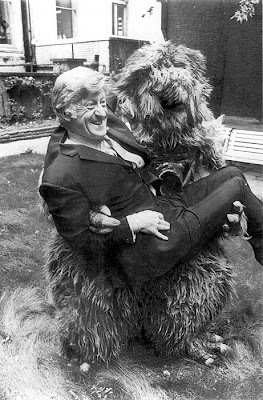 The Web Of Fear, set in the London Underground, is the epitome of the ‘yeti on the loo’ concept, a phrase coined by, oddly enough, Troughton’s successor Jon Pertwee, to explain the shift the series would undergo when the Time Lord was exiled to Earth by the start of Season 7 in 1970. It's ironic that the sound effect of the yeti's roar was also concocted by slowing down the recording of a flushing loo. The battle with the Yeti in the Underground was certainly a trial run for the UNIT set up and indeed introduced us to Colonel (later Brigadier) Lethbridge-Stewart, a character that would become a stalwart of the series. ‘Yeti On The Loo’ proposes that it’s far more interesting to bring the alien menaces to the familiar setting of Earth than it is meeting them in outer space. Many of the Troughton ‘base under siege’ stories rehearse this idea as early as The Faceless Ones (and, with Hartnell, even earlier if you go back to The War Machines), and become almost formulaic by the time The Web Of Fear and The Invasion are transmitted. It forever changed the idea of how the series was, and still is, perceived by the general public, and later producers Philip Hinchcliffe and Graham Williams emphatically moved the series away from contemporary Earth bound UNIT/Doctor conflicts with aliens. They could see the limitations of Innes Lloyd’s attempt to bring ‘realism’ to the series and saw it as a proverbial millstone round the neck of the programme. To them it simply repeated and repackaged particular post-war tropes in British SF, in the dystopias thoroughly explored by John Wyndham in The Day Of The Triffids and by Nigel Kneale with the Quatermass series on television. The Web Of Fear and Fury From The Deep, already an adaptation of Victor Pemberton’s radio serial The Slide, follow hot on the heels of Wyndham, described by Brian Aldiss as the "master of the cosy catastrophe." As in The Kraken Wakes, the weed creatures living at the bottom of a pipeline in Fury From The Deep can be destroyed by amplified sound. As in Quatermass And The Pit, aliens take over the iconic London Underground and London itself in The Web Of Fear. To witness where this trend takes us, and Doctor Who, then look no further than Tobe Hooper’s dead end, if not hilarious, homage to ‘cosy catastrophe’ Lifeforce. However, both The Web Of Fear and Fury From The Deep aren’t just the classic Doctor Who ‘base under siege’ and ‘yeti on the loo’ stories, emanating from a particularly British post-War psychosis, that we all know and love. They both share startling themes about physical and mental possession, about altered states of thinking. 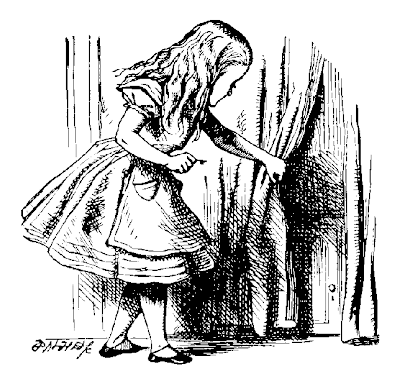 Going back to Lewis Carroll, both narratives take the viewer on a journey into the interior. This is a physical and psychical journey via the Underground tunnel systems and pipelines and like Alice venturing down the rabbit hole, some very strange things happen that are as far away from reality as you can get. Since the 1960s all the psychedelic qualities in Carroll’s work have frequently been read as an initiatory work of drug literature, an esoteric guide to the other worlds opened up by psychotropic substances. The re-emergence of Carroll within the counter culture tentatively reflects the changes that were then occurring within science fiction itself, where there was an express move away from the anti-utopianism of writers such as Wyndham and Kneale, whose paranoia filled fantasies were reflections on a disappearing post-war Britain, and towards the psychological approach of scientific romance, rejecting outer space for ‘inner space’. With a British perspective on Vietnam already being reflected in the science fiction of Michael Moorcock and J.G. Ballard, the battles with the Yeti in the Underground may be more reflective of the that conflict than merely a throw back to the British loss of colonial and military power post 1950. The striking quality of The Web Of Fear is that it is a story that not only takes place in an environment of sensory deprivation, where hypnotic susceptibility mirrors the possession of certain characters by the Great Intelligence, but also chillingly reflects the germ warfare experiments carried out by the MOD between 1952 and 1964. As reported in The Guardian in 2002, “These were tests to determine the vulnerability of large government buildings and public transport to attack. In 1956 bacteria were released on the London Underground at lunchtime along the Northern Line between Colliers Wood and Tooting Broadway. The results showed that the organism dispersed about 10 miles. Similar tests were conducted in tunnels running under government buildings in Whitehall.” Yeti spreading through the Underground may well be a subtle commentary on the barrage of government-run experiments to test the effects of everything from radiation, LSD and nerve gas to intense electric shocks and prolonged sensory deprivation. In Fury From The Deep, the effects of the deadly weed can be seen as a form of toxic psychosis. That’s a ‘bad trip’ to you and me. The adverse of effects of LSD were becoming newsworthy from 1962 until about 1969 with many reports of large numbers of LSD users hospitalised - some of them for considerable periods - following LSD trips. Reports of LSD accidents also increased - falls or jumps from windows, death when someone on LSD threw himself in front of a passing car, and so on. Bad trips were the result of drugs playing into individual insecurities. During the Cold War, both the British and the US governments were keen to exploit LSD's unique qualities, for "social engineering". They were convinced it would be useful as a "truth drug" during interrogations. There is a bleakness about Fury From The Deep. It tends to feel like one big come down after a season of playful psychedelia, especially in the way it depicts the possession of Maggie Harris by the weed. Stung by the deadly weed, she’s overpowered by the already possessed Mr. Quill and Mr. Oak who suffocate her with toxic gas emitted from their mouths. It’s a deeply troubling sequence, nightmarishly soundtracked with a pounding mix of incidental music and sound effects that give a nod to the acid rock and experimental electronic music of the time and the disorientating and malleable qualities of television mixing as director Hugh David piles images of Quill, Oak and the choking Maggie on top of each other against a seriously psychedelic bit of wallpaper in Maggie’s room. Even the ubiquitous foam machines come over as the series own equivalent of the barmy goings on at the 14-Hour Technicolour Dream, a happening in Alexandra Palace in 1967 that briefly ushered in British psychedelia. Once possessed, Maggie, walks into the sea, apparently drowning, uncannily replicating the behaviour of someone suffering from a bad trip, under the influence of the weed. Equally, when the weed is defeated by the sonic boom of Victoria’s screams, it also signals a sea-change in the counter culture itself. The final episode of Fury From The Deep was transmitted on the 20th April 1968. A fortnight later, students at the Sorbonne in Paris were out on the streets protesting and rioting whilst Doctor Who headed back into space with The Wheel In Space. Season Five contains, for good or bad, Innes Lloyd’s vision for Doctor and, as I’ve examined here, it also flirts with the counter-culture of the 1960s through his attempts to make the series more of its time. 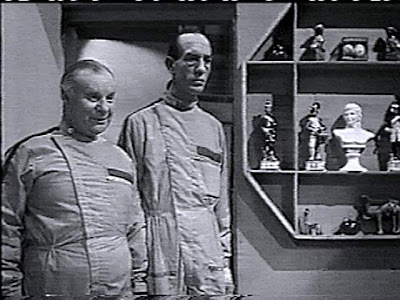 The legacy of British psychedelia in the series would be carried forward to its ultimate expression in the following season’s The Mind Robber and The Krotons. Further Vietnam War analogies would emerge with The Dominators and The War Games and the ‘yeti on the loo’ theme would find its ultimate expression in The Invasion and a far bleaker future coda in Season 7. The Mind Robber would arguably be the last attempt at real playfulness and fantasy within the series format for some time and The Space Pirates would remain a retro-futuristic anomaly until the space opera of Frontier In Space. But the 1960s, it seems, are always with us. There is a continual media weakness for anniversaries and the 1960s are still widely made to carry significant symbolic weight in contemporary social and political argument. The Doctor Who of Season Five makes you yearn for its dizzying spirit. This is too much nice blog. I got pleasure to read aboutDoctor Who. The pictures which are present in this blog are too much nice.